A Well-Seasoned Life: New Year, New Cookbook: "Petite Treats"
New Year, New Cookbook: "Petite Treats"
Have you resolved to stop buying pre-packaged, store-bought desserts? Are you determined that this is the year that you bake from scratch? Then, this new cookbook, Petite Treats, may be perfect for helping you keep at least one resolution this year. You may be familiar with the authors, Christy Beaver and Morgan Greenseth. Last year, they published the cookbook, Mini Pies, which I also reviewed. These ladies have a thing for small desserts. I'll admit that I do, too. I feel less guilty whenever I eat a small dessert. Plus, I feel like I can sample more than one dessert if they're small. If you own a copy of Mini Pies, you're familiar with its small, compact size. Petite Treats is comparable in size to that cookbook which makes it the perfect size as it takes up very little space on your bookshelf. It's easy to use as the pages open easily and stay open with just a little press of the spine. The small size also makes it perfect to pick up an extra copy and drop it in the mail to share with a friend. But, don't worry! Just because the book is small, that doesn't mean that it's skimpy on recipes. No, you'll find plenty of recipes in this cookbook. There are over four dozen recipes in this cookbook which is divided into five chapters: Morning Bites, Sweet Snacks, Classic Bites, Fancy Stuff, and Frostings, Fillings, Toppings, and Drizzles. Morning Bites is filled with some lovely little treats that will brighten up anyone's morning - Banana-Blueberry Muffins, Frosted Apple Spice Muffins, and Blueberry-Lavender Scookies. The recipes will make good use of your mini muffin tins and mini scone pans (if you're lucky enough to own one of them). You'll find plenty of recipes for various brownies, yippie pies (tiny whoopie pies), donuts, pies, and cakes. If you want to impress your guests, make some Strawberry Cream Eclairs or Tiraminiscule. In addition to the recipes, the cookbook is filled with "Sweet Tips" along the way to help guide you into making a successful treat. Some of the recipes are gluten-free or vegan-friendly, too. I enjoyed Mini Pies and was looking forward to this cookbook's release. 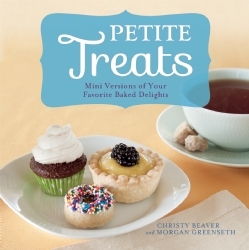 I am pleased with Petite Treats and am happy to add it to my cookbook collection.